You should always check out the length of time a dentist has been in practice, along with the professional associations they’re affiliated with and even the college/university your prospect attended for dental school. With years of experience practicing every aspect of dentistry, a connection with over 5 different professional associations, and the educational highlight of being 8th in her class at Texas A&M Baylor College of Dentistry, it’s no wonder she’s now an Adjunct Professor at her alma mater – and your choice for a qualified oral healthcare professional. 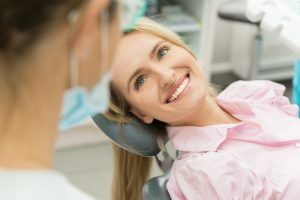 It’s extremely important to read online ratings and reviews to get an idea of what patients just like you have experienced while actually in the dental chair at the practice you’re considering. With a personal history of congenital oral health problems as a child and young adult, Dr. Fowler knows exactly what it feels like to be on the other side of dental care as a patient, and this gives her empathy, compassion, and a gentle touch that most patients prefer. If you search for us, you’ll be impressed by her 5/5 star rating on Facebook and Google! Although it seems obvious, be sure that the provider you’re looking into offers all of the services you need. And, since building a lifelong relationship is important, take things long term – although you might not need dental implants today, you could in the future, and they could benefit the older members of your family. We’re happy to provide a full range of services for patients of every ages – from kids to seniors and everyone in between. Everyone knows how frustrating the traffic can be in DFW, so try to find a dentist who close to either your work or home. We’re right off I-75 near downtown and our office is perfect for those who work downtown and who live in Highland Park, Uptown, White Rock Lake, and Deep Ellum. And, if you schedule an appointment midday, you can beat the traffic and see Dr. Fowler no matter where you live in DFW. Now that you know what to look for – and why Dr. Allison Fowler is the dentist for you – schedule an appointment today!